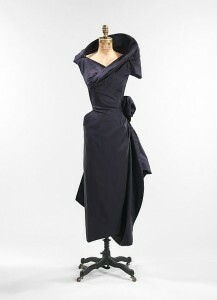 Fashion designer Charles James occupies a unique place in fashion history. A bad boy with an eye for fashion, he was expelled from school as a teen and lost his atelier to creditors at the height of his career. While heiresses and movie stars once waited patiently for his one-of-a-kind ballgowns – and Dior and Balenciaga sang his praises – he died penniless and has been all but forgotten outside the fashion world. 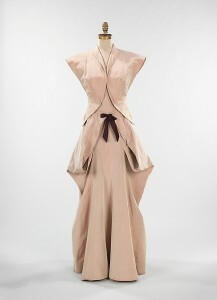 His work is the subject of this year’s Costume Institute’s summer exhibit. So who was he and what made him famous? Born in England in 1906 to a British Army officer and a Chicago socialite, Charles James was, for many years, the black sheep of his family. He attended Harrow as a teen, where his classmates included Evelyn Waugh and lifelong friend, Cecil Beaton. He excelled at math and science. But he was openly gay and like his friends, felt that beautiful manners and bad behavior was the essence of chic. He was expelled from Harrow for sexual misconduct. Embarrassed, his parents sent him to his mother’s family in Chicago to instill some discipline. His grandfather found him a desk job at a friend’s utilities company. But flamboyant Charles – or Charlie, as he was known – staged a beach wear fashion show at work, and was promptly reassigned to the staid architectural department. He loved it. He enjoyed the math, engineering, and aesthetic aspects and absorbed all he could. 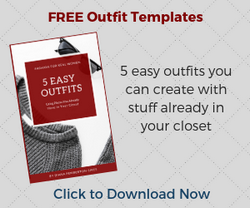 He later used this knowledge in garment design. But he still enjoyed causing trouble, particularly for his father. He opened his first hat shop on North State Street in Chicago in 1926 using the last name of one of his classmates, Charles Boucheron. His father was appalled. Not only was dabbling “in trade” unthinkable for a member of his class, fashion was not “manly.” Mr. James forbade his wife and daughters to patronize the store. But Mrs. James’ friends did. In fact, Charlie so charmed his mother’s social set that Charles Boucheron quickly became one of Chicago’s most popular stores. Two years later, Charlie – feeling a bigger destiny awaited him – moved to New York. After spending the summer of 1928 selling hats in Southampton to the likes of Diana Vreeland, he set up shop in Queens making hats and clothes for Manhattan boutiques. He called upon his old friend Cecil Beaton to introduce him to the fashion press, and soon, society ladies on both sides of the Atlantic came calling. So in 1929, at age 23, Charlie decided he was ready for “the big time.” He moved back to London and opened a salon near Savile Row. But it quickly went bankrupt. Humbled, he scaled down and went back to designing hats and clothes for department stores in London, Paris, and New York. He also spent some time in Paris honing his craft. In time, several of his designs caught on, including the wrap around “taxi dress,” which apparently, could be put on in the back of a taxi (though why it would be off in the back of a taxi is anyone’s guess). Look at those designs – you could wear those dresses today. Encouraged by his success, James reopened his salon in London in 1934 and continued to design for various luxury stores while also taking on couture clients. 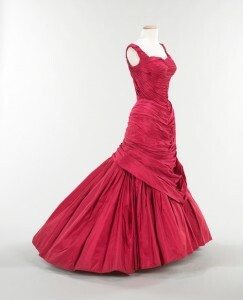 He later opened shops in Paris and New York as well, and began designing costumes. By the mid-1940’s, James began refining his signature architectural look. 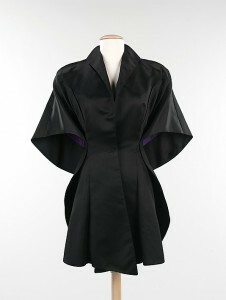 He preferred asymmetrical lines and complicated seams coupled with unexpected fabrics and embellishments. 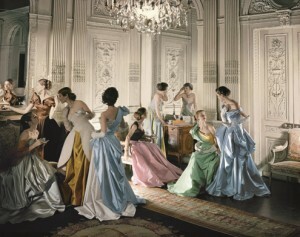 In 1948, Cecil Beaton photographed one of the most iconic images ever seen in Vogue, a group of women wearing Charles James’ gowns. 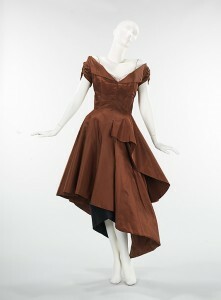 It was a heady time for Charles James, and the height of his career. This was when he began making those one-of-a-kind ballgowns that established his legacy. 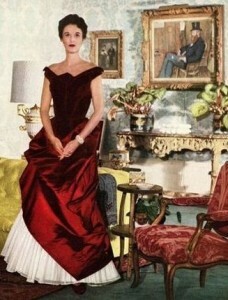 His only rival architecturally was Balenciaga, who once said, “Charles James is not only the greatest American couturier, but the world’s best and only dressmaker who raised it from an applied art form to a true art form.” Amazing praise, indeed, from someone who himself was considered a perfectionist. 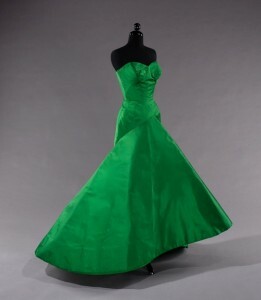 Charles James was awarded the Coty Award for Design in 1950 (and again in 1954), and the Neiman Marcus Award – the Oscars of fashion – in 1953. In 1954, at the age of 48, he shocked everyone by marrying one of his clients, a wealthy divorcee from Kansas named Nancy Lee Gregory. She was twenty years his junior, and they had two children, a boy in 1956, and a girl a year later. It should have been an happy time, but instead, it was the end of his career. In 1957, the IRS seized his New York atelier for unpaid taxes. What they didn’t take, his creditors did. James filed for bankruptcy and closed his shop in 1958, then spent the next few years with his family, on the run, moving frequently to avoid his creditors. By 1961, Nancy had had enough. She took the kids, went back to Kansas, and filed for divorce. Charlie went back to New York and tried to reboot his career. But no one was interested. Times had changed. He’d burned too many bridges. He moved into the Chelsea Hotel in 1964, and spent most of the 1960’s guest lecturing and writing his memoirs. He also wrote a manuscript called, “Beyond Fashion,” but it was never published. He also managed a few couture commissions here and there, but no one really wore him any more. 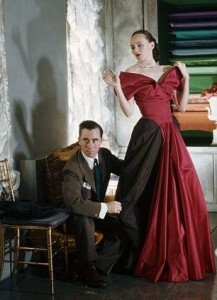 Charles James died in 1978, alone and in debt – and forgotten by most people outside the fashion industry. 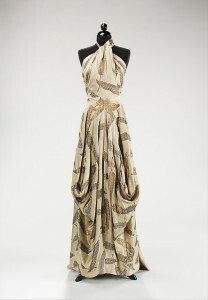 Like Paul Poiret, it was a sad end for such an extraordinary talent. So what led to his downfall? 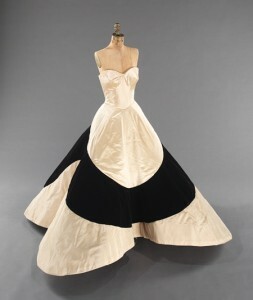 Charles James knew from an early age that he was destined for great things – which is why, by the age of 30, his client roster read like a “Who’s Who” of high society and he had salons in London, Paris, and New York. But he was never satisfied with what he had, and kept adding more and more. He stretched himself so thin, and was juggling so many things at once – private clients, department store collections, licensing deals, etc. – that he couldn’t maintain them all AND do a good job. Something had to give. Unfortunately, it was his empire. 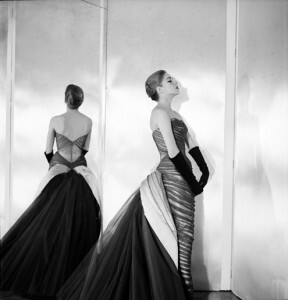 Charles James was obsessed with perfection, often taking so much time and effort to work and rework various garments that he produced them late and at a loss – even at his ridiculously high prices. The House of Balenciaga managed to turn out 300 ensembles a year – roughly six a week – even with Cristabol’s demanding standards. 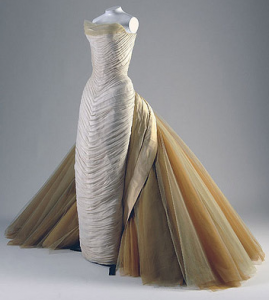 By contrast, Charles James averaged about 50 ensembles a year – less than one a week – creating just shy of 2,000 garments over his 40 year career. If he’d been as productive as Balenciaga, he would have had five times the income. Charlie was not a good manager of time, money, or his business, and it led to financial ruin. He spent his entire career in debt and over-leveraged. He even burned through his wife’s money within five years of their marriage. The other three things could have been overcome with a good management team, but Charlie’s frequent drug use and prescription abuse made him paranoid and distrustful. It only got worse with age. By the 1970’s, he’d managed to alienate everyone in his circle, including Cecil Beaton and Diana Vreeland. The only one who stuck with him was his protege, Halston. It’s hard to see genius go down in flames. 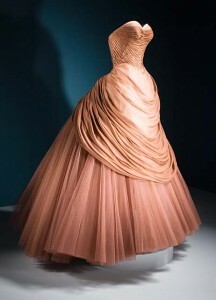 But it happens all the time, and it happened to Charles James. 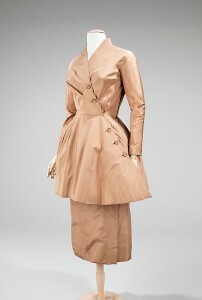 Most of the nearly 2,000 garments he made in his career have found their way to museums, including the Costume Institute of the Metropolitan Museum. If you’ll be visiting New York this summer, make plans to spend an afternoon there. It will be well worth your time. I’d love to see profiles of designers that at my age – early 30’s – I’ve heard of too! Maybe Dior, Givenchy, Prada, Chanel (did you see the new film about him? ), etc. 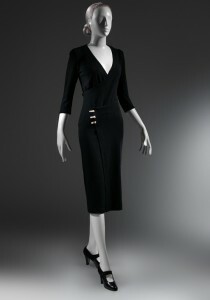 Also I’d love to know Halston’s history. I only heard of them through Sarah Jessica Parker’s link with Halston Heritage, and I liked what I saw of that brand. Wow, that is one of the saddest stories! What a waste…Glad some of his creations are in museums to see. Wish it would inspire some of today’s designers to create clothes even half as beautiful as his. It would be an improvement. Thanks for sharing this. Glad you enjoyed it! Yes, he was SO talented but spread himself too thin. If he’d managed his business like Chanel, Dior, or Balenciaga, he’d still be around today – like they are. Like so many others, he burned brightly for a very short time. Sad.